This weekend The Climbing Works saw a flying visit from Chris Sharma who was mid lecture tour, so on Monday I took him up to Malham Cove in North Yorkshire. After nearly two hours of battling with the traffic we arrived at the crag. Chris was super psyched to be there even though it was very cold and slightly damp. We warmed up with a cold top rope of 'Consenting Adults' (F7a) and then Chris was keen to get straight on 'Rainshadow' (F9a). Chris made a rare onsight (possibly the first??) 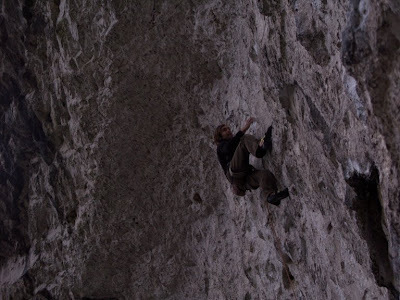 of 'Raindogs' (F8a) in ridiculously cold temperatures and then proceeded to work out the moves on the rest of 'Rainshadow' with relative ease and even power screaming when he was commited. 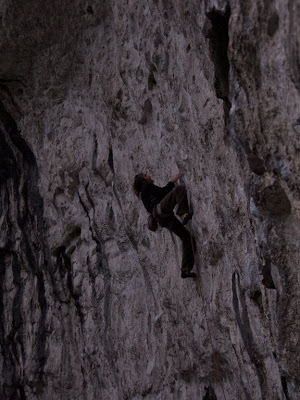 He then had a couple more very impressive redpoint attempts at Rainshadow but with no success. 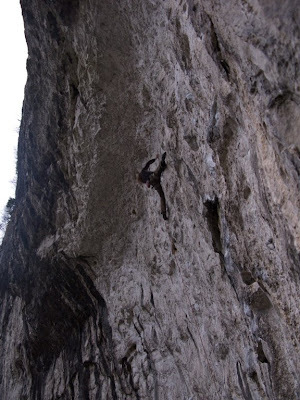 Chris commented on how good the route was and how he was psyched to come back and try it again. Today has seen both the comp wall and the yellow circuit stripped all in preparation for Saturday and the C.W.I.F. Sam got to work on the comp wall this morning as Percy was off to the airport to pick up Monsieur Jacky Godoffe & TondeÂ Katiyo, our international routesetters. After a cup of coffee and a bite to eat, the boys have set off to work on the blank canvas off the comp wall with these special Percy beauties. - For those who are just having a day of fun, you can climb as long as you want. Just hand in your scorecards for the chance to win in the end of day raffle. - The wall will be open as usual right through the day.